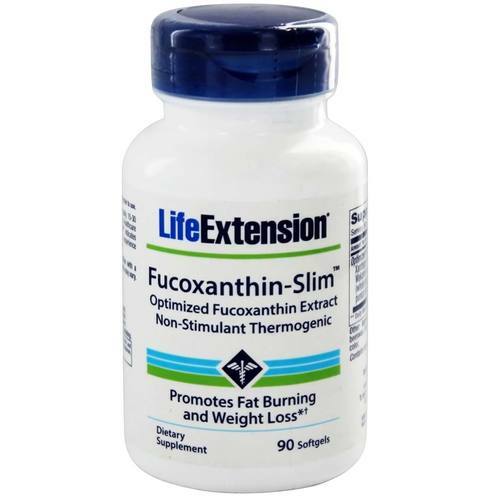 Give your body's metabolism a boost with Fucoxanthin-Slim from Life Extension. It's a daily dietary supplement that helps encourage your body's thermogenic process. Thermogensis is your body's way of telling the fatty acids you consume to turn into energy rather than settle into your body as fat. Fucoxanthin-Slim targets fat cells and energy distribution in aging adults and helps promote long-term weight loss and weight management. Each dose also contains pomegranate seed oil, which helps enhance the benefits of fucoxanthin by keeping fat cells from growing. Take a natural, intensive approach to weight loss with Fucoxanthin-Slim today at eVitamins. Warnings: Keep out of reach of children. Do not exceed recommended dose. Consult with medical professional if you are undergoing medical treatment or if you are pregnant or lactating. Clinical research using Xanthigen indicates that it may take 6 weeks of consecutive use to experience significant thermogenic response. Recommended Use: Take one softgel three times daily, 15 to 30 minutes before meals or as recommended by a healthcare professional.